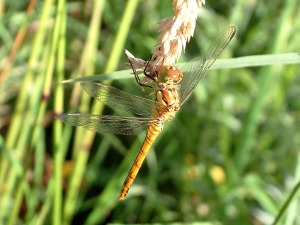 Observation - Common Darter dragonfly - UK and Ireland. Description: This individual appeared quite golden in the early evening sun. Female and immature darters can be hard to identify, but I've only seen the Common Darter at this site in previous years. This individual appeared quite golden in the early evening sun. Female and immature darters can be hard to identify, but I've only seen the Common Darter at this site in previous years.